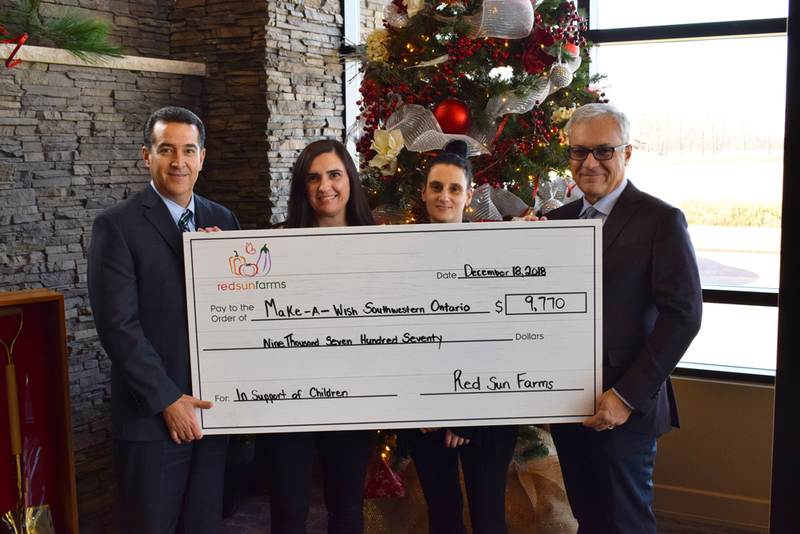 Kingsville, ON – (Dec 19,2018) – Once again, Red Sun Farms is spreading holiday cheer in support of Make-A-Wish Southwestern Ontario. In 2017, The team at Red Sun began a program to promote healthy lifestyles in the workplace, by providing produce boxes for their employees for the mere cost of five dollars per box. The large boxes would contain ample amounts of fresh quality vegetables, straight from the Red Sun Greenhouses, and as an added incentive all the money collected from the produce box purchases would be donated to the Make-A-Wish Southwestern Ontario. This organization is a non-profit that grants the wishes of children living with critical illnesses. Upon hearing the team’s plan Red Sun Farms President Jim DiMenna decided to sweeten the deal by matching every dollar raised in support of the initiative. Last year Jim and the team at Red Sun Farms raised and donated $5,720 dollars. Red Sun Farms is the largest vertically integrated North American Greenhouse grower, ensuring control over every step of the supply chain. Red Sun Farms owns greenhouses in Mexico, USA and Canada. Quality is maintained throughout seed selection, propagation, growing, harvesting, packaging and the transportation to their partner’s stores. When you buy from Red Sun Farms, you are buying direct from the grower.